The golf short game technique is an importance part of a golf game. When the ball is on the putting green a golfer need the know the putting swing skill to hit the ball into the hole with a club called putter. The chipping and pitching swing skills are usually employed by the golfer to hit the ball to the hole from the outside of the putting green. There is also the greenside sandbunker playing skills to be learned. The golf tour professionals and advance golfers spend a lot of their training time perfecting their golf short game technique performances. At Asian Golf Centre, we will demonstrate, teach and assist your learning of the golf short games swing technique. You will learn to use the golf clubs called Pitching Wedge (PW) and Sand Wedge (SW) to produce a golf pitch-shot trajectory. The fun and thrill of the golf short game plays is that you are able to see your golf ball fly toward and come to rest near hole. The highlight and intensity of the learning is to able to get ball into the hole with least number of swing execution; that what requires for a golf game. You will be given the patience and passion not only to test and measure your shotmaking proficiency, but to transform into a proficient golfer. play. Why is it important to know? 2. You will learn and acquire the putting skill for long and short putts. 3. You will learn the golf chipping and pitching swing technique. When and how to apply it for your game? 4. You will learn sandbunker playing technique. How to get the golf ball out the sandbunker? 5. You will learn special golf shot technique performance. 6. Gain the technical knowledge and importance to be a proficient golfer. This programme is design for potential golfer with no knowledge and skills of the golf short game playing technique. A potential golfer looking for an effective and efficient coach to teach the all-important golf short game technique and applications. Our requirement is that you come for lessons with the full enthusiasm of wanting to learn the golf short games play - "a game within a golf game". This lesson teaches the beginner golfer the must know knowledge and skill to perform golf putting swing technique. The goal is to putt the golf ball into the hole with the least number of putts on the putting green. The golf putting swing is the most challenging technique because every putting green on the golf course is uniquely designed. 1. You learn the technical design of a golf putter club. What is the 'off-set hosel' of a golf putter club? 2. You observe the performance of a golf putting swing technique and the golf ball outcome performance. 3. You learn the golf ball rolling action of a golf putting swing technique. 4. You learn and understand the application of golf putting shot performance for golf game. 5. You learn the correct posture setup of the body to facilitate for the golf putting swing technique performance. 6. You learn the importance of 'Eyes over golf ball' optical position for the golf putting swing technique. 7. You learn the correct way to hold a putter for the putting swing technique. 8. You learn the correct golf ball and putter clubface position for the golf putting swing technique. 9. You learn the 'Directional alignment of body' for your golf putting swing technique. 10. You learn how to align the golf ball towards the target. 11. You learn the 'Dynamic Postural Stability' when performing the golf putting swing technique. why is it important to know? 12. You learn the 'Pendulum swing movement'. Why is it important to know? 13. You learn the correct 'Function of the lower and upper body' for the golf putting swing technique. 14. You learn the correct hands, arms and shoulders movements for the golf putting swing technique. 15. You learn the where is the correct position for the clubface to impact on the golf ball for your putting swing technique. 16. You learn the correct 'Back-swing (take away), Forward-swing and Follow-through' of an efficient putting stroke. 17. You learn and understand the proper 'Follow through' swing action for an effective putting swing technique. 18. You learn how to execute short putts accurately? 19. You learn how to execute short putts when the putting surface has a slight slope. 20. You learn the cause and effect of the incorrect clubface impact on the golf ball. 21. You learn the 'Goal setting' for your golf putting swing technique and outcome performance. 22. You learn what is 'Visualization' in golf psychology and the application for your golf putting shot performance. 23. You learn what and how to perform your 'Pre-shot routine'? Why is it important to know? 24. You learn how to use your Dominant Neurological Senses' for your optimum putter-face acceleration and speed control. 25. You learn what is 'Attentional Control' in golf psychology and the application for the golf putting swing technique performance? 27. You learn to pattern your golf putting swing technique by focusing on 'Process goal' in golf psychology. 28. You learn the 'External focus' of your putting swing technique by applying NLP™ Visual and Auditory modalities. 29. You learn what is 'Intrinsic and Extrinsic feedbacks' in golf psychology of your golf putting swing technique performance? 30. You learn what is self-assertive state of 'Conscious Competence' of your golf putting swing technique performance? This lesson teaches the beginner golfer the must know knowledge and skill to perform golf chipping swing technique. The goal is to produce a low trajectory golf ball flight performance that enable the golf ball to stop near the hole. A short iron golf clubs is used. The golf ball is plays from just outside the putting green. This is an essential golf skill. 2. You learn the golf ball flight performance of a golf chipping technique. 3. You learn and understand the application of the golf chipping shot performance for the golf game. 4. You learn the correct of posture setup of the body to facilitate for the golf chipping swing technique performance. 5. You learn the correct 'Directional alignment of body' for your golf chipping shot performance. Why is it important to know? 6. You learn the correct 'Functions of the lower and upper body' for the golf chipping swing technique. 7. You learn the correct hands, arms and shoulders dynamic movements for the golf chipping swing technique. 8. You learn the correct golf ball position for optimum impact by the clubface. 9. You learn and understand the proper 'Follow-through' swing action for an efficient golf shot execution. 10. You learn the 'Carry and Roll distance' of the chipping golf ball flight performance. Why is it important to know? 11. You learn the cause and effect of the incorrect clubface impact on the golf ball. 12. You learn the 'Goal setting' for your golf chipping swing technique and outcome performance. 13. You learn what is 'Visualization' in golf psychology and the application for the golf chipping shot performance. 14. You learn what and how to perform your 'Pre-shot routine'? Why is it important to know? 15. You learn what is 'Attentional Control' in golf psychology and the application for the golf chipping swing technique? 17. You learn to pattern your the golf ball striking effectiveness by applying the NLP™ Sub-modalities. 18. You learn the 'External focus' of your golf chipping swing technique by applying NLP™ Visual and Auditory sub-modalities. 19. You learn what is 'Intrinsic and Extrinsic feedbacks' in golf psychology of your golf chipping technique performance? This lesson teaches the beginner golfer the must know knowledge and skill to perform the golf pitching swing technique. The goal is to produce a golf ball flight performance that enable the golf ball to stop on the putting green. The golf pitching wedge club is used. The golf ball is plays from just outside the putting green, and up 80 meters from the hole. 1. You observe the performance of a golf pitching technique and outcome performance. 2. You learn the golf flight performance of a golf pitching technique. 3. You learn and understand the application of golf pitching shot performance for the golf game. 4. You learn the correct of posture setup of the body to facilitate for the golf pitching swing technique performance. 5. You learn the correct 'Directional alignment of body' for your golf pitching shot performance. Why is it important to know? 6. You learn the correct 'Functions of the lower and upper body' for the golf pitching swing technique. 7. You learn the correct hands, arms and shoulders dynamic movements for the golf pitching swing technique. 8. You learn the correct golf ball position for perfect impact by the clubface. 10. You learn the 'Carry and Roll distance' of the pitching golf ball flight performance. Why is it important to know? 12. You learn the 'Goal setting' for your golf pitching swing technique and outcome performance. 13. You learn what is 'Visualization' in golf psychology and the application for the golf pitching shot performance. 15. You learn what is 'Attentional Control' in golf psychology and the application for the golf pitching swing technique. 18. You learn your 'External focus' of your golf pitching swing technique by applying NLP™ Visual and Auditory submodalities. 19. You learn what is 'Intrinsic and Extrinsic feedbacks' in golf psychology of your golf pitching technique performance. This lesson teaches the beginner golfer the must know knowledge, skill and attitude to perform the greenside sandbunker technique. The sandbunker is a hazard on golf course to challenge a golfer swing technique proficiency. The goal is to get the golf ball out of the sandbunker in one swing attempt. 1. You learn the technical 'Loft angle' and 'Bounce angle' design of a golf sand-wedge club. 2. You observe the performance of a golf sandbunker swing technique and outcome performance. 3. You learn the golf ball flight performance of a golf sandbunker swing technique. 4. You learn and understand the application of golf sandbunker shot performances for the golf game. 5. You learn the importance of posture setup of the body in the sandbunker to facilitate for the golf sandbunker swing technique. 6. You learn the 'Dynamic Postural Stability' when playing the golf ball on the sand. Why is it important to know? 7. You learn the correct 'Function of the lower and upper body' for the golf sandbunker swing technique. 8. You learn the correct of the hands, arms and shoulders dynamic movements for the golf sandbunker swing technique. 9. You learn the wrists 'Flexion and Extension' movements for the golf sandbunker swing technique. 11. Your learn what is 'Descending swing angle of impactand Lowest point of the swing arc' of the sandbunker swing technique. 12. You learn and understand the proper 'Follow through' swing action for an efficient sandbunker swing technique. 13. You learn the cause and effect of the incorrect 'point of impact on the sand' behind the golf ball. 14. You learn the 'Goal setting' for your golf sandbunker swing technique and outcome performance. 15. You learn what is 'Visualization' in golf psychology and the application for the golf sandbunker shot performance. 16. You learn what and how to perform your 'Pre-shot routine'? Why is it important to know? 17. You learn what is 'Attentional Control' in golf psychology and the application for the golf sandbunker swing technique. 18. You learn to pattern your golf sandbunker swing technique by focusing on the 'Process goal' in golf psychology. 19. You learn to pattern your golf ball striking effectiveness by applying the NLP™ Sub-modalities. 20. You learn the 'External focus' of your golf sandbunker swing technique by applying NLP™ Visual and Auditory sub- modalities. 21. You learn what is 'Intrinsic and Extrinsic feedbacks' in golf psychology of your golf sandbunker swing technique performance? This lesson teaches the beginner golfer to produce a low-trajectory ball flight performance. 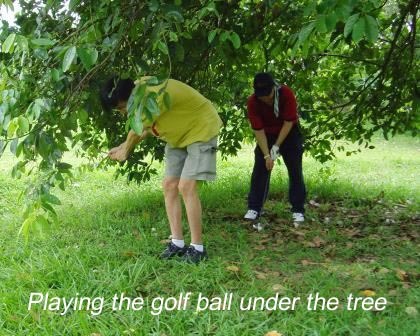 The goal is to get the golf ball to fly under a tree or trees' branches to the putting green. 1. You observe the performance of an 'Improvise' low-trajectory golf swing technique and outcome performance. 2. You learn the golf flight performance of an 'Improvise' low-trajectory golf swing technique. 3. You learn and understand the application of the 'Improvise' low-trajectory golf shot performance for the golf game. 4. You learn the correct of posture setup of the body to facilitate for the 'Improvise' low-trajectory golf swing technique performance. 6. You learn the correct 'Functions of the lower and upper body' for the 'Improvise' low-trajectory golf swing technique. 7. You learn the correct hands, arms and shoulders dynamic movements for the 'Improvise' low-trajectory golf swing technique. 8. You learn the correct golf ball position for your optimum impact by the clubface. 9. You learn and understand the proper 'Follow through' swing action for an efficient 'Improvise' low-trajectory golf swing technique. 10. You learn the 'Carry and Roll distance' of the 'Improvise' low-trajectory golf ball flight performance. Why is it important to know? 12. You learn the 'Goal setting' for your 'Improvise' low-trajectory golf swing technique and outcome performance. 13. You learn what is 'Visualization' in golf psychology and the application for your 'Improvise' low-trajectory golf shot performance. 15. You learn what is 'Attentional Control' in golf psychology and the application for your 'Improvise' low-trajectory golf swing technique. 19. You learn what is 'Intrinsic and Extrinsic feedbacks' of the your 'Improvise' low-trajectory golf swing technique performance. 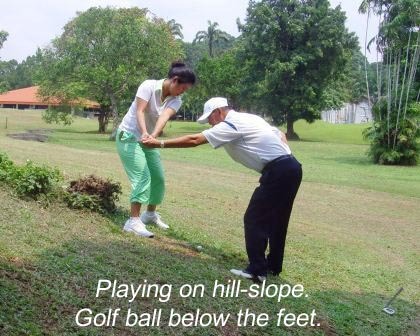 This lesson teaches the beginner golfer how to play the golf ball on a hill-side slope. The goal is able to setup the correct golf posture and produce a effective shot performance. The ball is plays from outside the putting green and up to 50 meters from the hole. 1. You observe the performance of an 'Improvise' hill-side golf swing technique and outcome performance. 2. You learn the golf flight performance of an 'Improvise' hill-side golf swing technique. 3. You learn and understand the application of the 'Improvise' hill-side golf shot performance for the golf game. 4. You learn the correct of posture setup of the body to facilitate for the 'Improvise' hill-side golf swing technique performance. 6. You learn the correct 'Functions of the lower and upper body' for the 'Improvise' hill-side golf swing technique. 7. You learn the correct hands, arms and shoulders dynamic movements for the 'Improvise' hill-side golf swing technique. 9. You learn and understand the proper 'Follow through' swing action for an efficient 'Improvise' hill-side golf swing technique. 10. 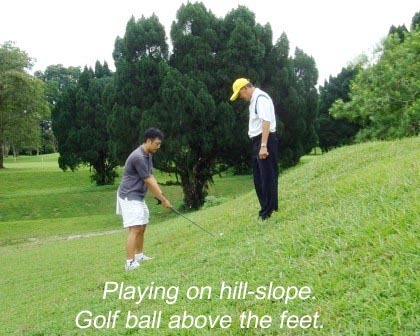 You learn the 'Carry and Roll distance'of the 'Improvise' hill-side golf ball flight performance. Why is it important to know? 12. You learn the 'Goal setting' for your 'Improvise' hill-side golf swing technique and outcome performance. 13. You learn what is 'Visualization' in golf psychology and the application for your 'Improvise' hill-side golf shot performance. 15. You learn what is 'Attentional Control' in golf psychology and the application for the 'Improvise' hill-side golf swing technique. 19. You learn what is 'Intrinsic and Extrinsic feedbacks' of the your 'Improvise' hill-side golf swing technique performance. Your ultimate goal of learning the Golf Short Game Swing Technique is to gain: the practical knowledge; mental skills and experiential learning. You will be surprised from your heuristic learning that you can improvise your golf swing technique with a different golf iron club to produce the desire ball flight performance. 1. Include your golf short game swing technique in your normal golf swing practice plan. 3. Record your personal golf short game technique for your targeted-distance performances. 4. Monitor your improvement and take notes of all your shots performance outcomes; physically and psychologically. 5. Prepare yourself to sign up for the Beginner Golfer Course Playing Program to experience the game in real playing condition. 6. Create of your golf journal and value-laden feedback of your performance. The Beginner Golf Short Games Swing Technique Learning and Training Programme comprises of 6 lessons. golf swing technique practices. Currently the cost is $2.00 for 40 practice balls.